The morning started out gray with a heavy mist of humidity fanning out over the city. But, I was not going to be deterred from an outing to Pratunam Market. For months I've heard of the market dedicated almost exclusively to clothing and beauty products. So, after skytraining my way to central Bangkok and disembarking at Siam station. I proceeded out into the humid air and let my green leather flip flops clap their way down the cement stairs and to street level. Vendors were out early, already hawking their noodles and adorable miniature pineapples (I ended up going home with six... how can you pass up a miniature pineapple?!). I walked past CentralWorld, the newest of Bangkok's ultra glossy super shopping centers, and found myself waiting to cross a quadruple lane road along with a gaggle of Thai women wearing towering heels and chatting excitedly. I held my breath and followed with the pack as soon as there was a slight clearing of the rushing taxis and tuk tuks. Exhaling with relief, as I have learned is "normal" for me to do upon successfully crossing traffic, I set foot on the opposite side's crumbling sidewalk and surveyed the scene. So this was the edge of the famous Pratunam Market. Judging from the size of the crowds milling, morning was a popular time to head to Pratunam. People were everywhere. Women in their heels and pencil skirts shaded themselves with parasols, men in short-sleeved polo shirts dabbed at the perspiration already forming on their brows with brightly colored handkerchiefs and market employees dressed in aprons bustled about hauling huge carts of assorted goods. But, like all good markets in Thailand, the edge is merely the beginning. Like a present being unwrapped, one must step into the covered, dimly lit curving alleyways of a market in order to really discover the prize. Tables heaped with long flowing bunches of glistening black human hair, baskets toppling over with every shade of nail polish imaginable and rows and rows of tiny pencil skirts and matching patent leather heels awaited inside. Throwing myself into one of the markets narrow openings, I turned down the twisty alleys until the crowds thinned a bit and saw the huge Buddha surrounded by tables covered in tiny offering plates. I'd later find out that rather than have vendors set out food offerings by their own stalls, as is common at other markets, Pratunam was built to provide a central offering place that all stall owners could contribute to as desired. The rule was established to cut down on vermin within the market, and for that I was glad. One doesn't desire to reach for a strand of human hair and be surprised by a rat popping out of it. A tiny little twinkling caught the corner of my eye. One twist and another turn and I was standing at the open mouth of an amazing site, unlike any other treasure I had yet found in Bangkok. Some time ago, this may have been just a quick pass thru to lead a visitor to another bustling area of the market. But, today, the sun streamed in (as this tiny alley wasn't covered like all of the others) and glitter and sequins were scattered over the cement floor and walls. It was if someone skim coated the entire place in concrete and then let the sparkly confetti fly, trapped for eternity! Note to self: absolutely brilliant and to be replicated in a future home sometime, somewhere. I walked slowly through, taking it all in and cursing the fact that I didn't bring my camera on this outing. At the end of the dazzling alley, the market began again, but this area had a much different tone. Huge feather boas were strung around the necks of male mannequins wearing giant cotton candy wigs and bedazzled evening gowns in neon that trumpeted out into tulip trains. Seamstresses sat at tiny sewing machines behind the mannequins creating even more elaborate gowns at a shocking pace. Yards and yards of tulle and man-sized heels in every shade of an extra glossy rainbow brilliantly lined nearby racks. I laughed out loud, dazzled by the color and the show, half expecting a drag version of a Bollywood movie's dance scene to pop to life in front of me. After a hot and humid morning exploring the back alleys of a local market, I crave a crunchy fresh dish for lunch and a giant glass of water filled with ice and lime wedges. Here's one of my favorite lunches that also works great as a side to dishes like Pad Thai or Philippine Ribs. In a large bowl, whisk the vinegar, oils peppers and salt. Add the cabbage, carrots and onions. Mix well. Refridgerate for at least 20 minutes. Add cilantro just prior to serving and mix well. Serve with a lemon wedge and a sliced hard boiled egg, if desired. I arrive next week. We haven't been to Pratnum yet. Sounds fantastic. Is it a weekend-only market? Isn't Pratunam awesome? I found an alleyway like the one you wrote about there and haven't been able to find it again. Not such a great market for buying stuff though is it. More for the journey of it. Cheers. Pratunam is a little hidden find in Bangkok. I found that it takes a good several hours to really fall in love with it. And, the towering Pratunam market (indoors) shouldn't be missed either. The outside market is more "local" and interesting but the inside "tower" is where the good buys on cool clothing is. 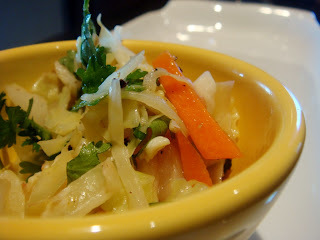 That slaw looks so refreshing for a hot summer day. It's hot here now (Oregon, USA) and I'm looking for no-cook recipes!